Meridian Media Core 600 offers Sooloos multiroom system in one box | What Hi-Fi? Meridian's new Media Core 600 Sooloos system offers a multiroom digital media system in a single box, for the princely sum of £6000. It's the company's most powerful Sooloos system to date, with a pair of 2TB hard disk drives configured as a RAID 1 array, and capable of storing 5000 CD albums in lossless quality. 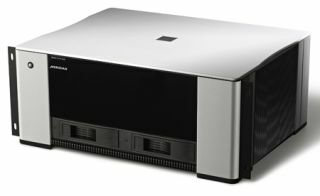 Housed in a brand-new case design, the Media Core 600 can feed up to six zones around the home, connects to the internet as well as any of Meridian's DSP speakers, can be controlled using the Sooloos app for iPad/iPhone/iPod touch and can be combined with other Sooloos products to expand the system. Designed for rack mounting, there's an advanced switch-mode power supply and built-in cooling system.